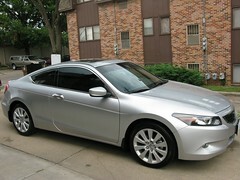 This is the outside of Ken’s Honda Accord Coupe. Here is a matter-of-fact discussion with former KGB officer, Yuri Bezmenov. In this short clip, he explains the principle aims and incredible success of a program to demoralize and crush the United States over the course of a few generations. Once begun, the process feeds on itself without any further outside help—without the involvement of “card-carrying communists” or Soviet agents. Cool little tripod with bendable legs I bought at Best Buy. Eating with parents and nephew at Logan’s Steakhouse. In refrigeratoin repair shop in Bedford, Pennsylvania.